Heat oven to 450°F. In medium bowl, stir 2 cups of the Bisquick mix and 2/3 cup of the milk until soft dough forms. On ungreased cookie sheet, drop dough by 6 spoonfuls. Bake 8 to 10 minutes or until tops are golden brown. Meanwhile, in 2-quart saucepan, stir remaining 2 cups milk and 1/4 cup Bisquick mix with wire whisk until completely smooth. Cook over medium heat 9 to 11 minutes, stirring constantly, until sauce thickens. Gently stir in cheese, tuna and pepper. Cook 1 to 2 minutes, stirring constantly, until hot. Cook broccoli as directed on package; drain. To serve, split each biscuit; arrange bottoms on serving plate. 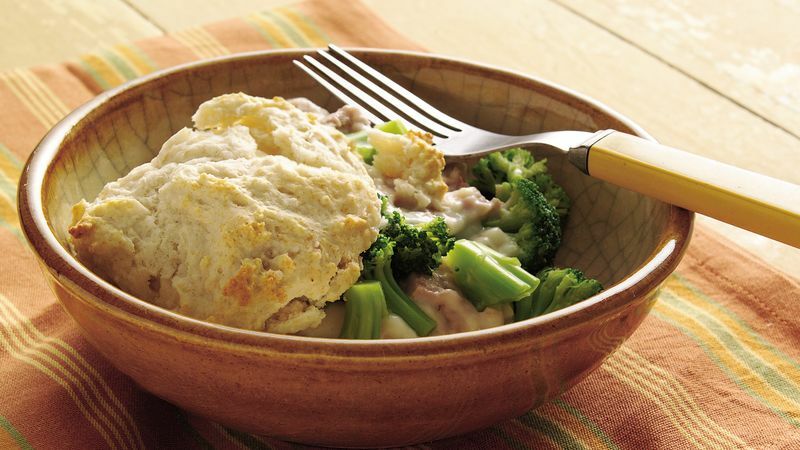 Top each with slightly less than 1/2 cup tuna mixture and 1/4 cup broccoli. Top with biscuit tops. Sliced cucumbers and tomato wedges make a colorful side for the biscuits.